Why Does a Tool Cut? Have you been to Joel Moskowitz’s blog at Tools for Working Wood? The one about Work – An Illustrated Magazine of Practice and Theory for All Workmen, Professional and Amateur? Joel insists it is the greatest of all the DIY publications and after reading the first blog I agree. This blog is fantastic and not be be missed! Plus, Joel is publishing the blog in relation to Work’s original publication dates. So, issue #1, which came out on March 23, 1889 appeared on The Work Magazine Reprint Project blog on March 23, 2012. Joel and his crew have been scanning, cleaning and reprinting Work Magazine as new blog installments. I know you have too many blogs to follow already but this one is quite different. The information offered by the magazine emphasized more practical projects, more of them, and lots and lots of drawings and illustrations. The target subscriber was the nineteenth century do-it-yourselfer, the practical man, who these days would be part of the “maker crowd”. Sounds like … YOU (and ME!) This is rich, dense, useful, fascinating stuff. And an uncommon peak into the lives of “makers” like us in the nineteenth century. I was especially interested in the article on page 21 of Volume I, Number 2, Why Does a Tool Cut? part 1, by “J.H.” The article goes into considerable detail of the cutting action of any blade and sums up: …in order that a tool shall cut wedge-like action is necessary. But the degrees of acuteness of the wedges have to be widely modified for the operation of softer and harder materials, in order to afford sufficient permanence of cutting edge. And the angle of relief should be kept as low as possible. These are axioms in tool formation, no matter how widely the shapes of the tools themselves vary. 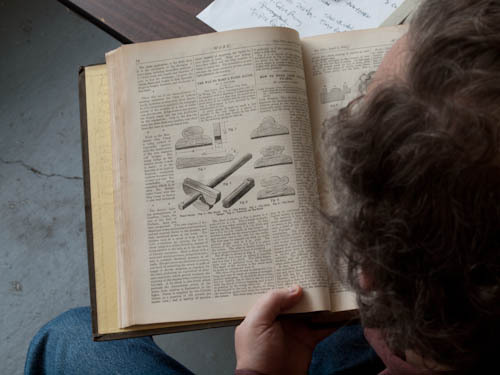 Part 2 of the article is on pages 59 and 60 of Volume 1, Issue Number 4 and goes into much more detail with specific applications to everyday tools and how they should be sharpened. I’ve subscribed to this blog on my Google Reader page and look forward to each new installment. Many thanks to Joel, Tim and Ben (did I leave anyone out?) at Tools for Working Wood for this labor of love. Next Next post: Make a Greenwood Chair!